What is the best Accountancy Software package for EoFY? Best Accounting Software 2017 (Picture: GotCredit, Flickr). The days of dowdy accounting software – that which was made to keep accountants in business and infuriate business users – are behind us. Lead by several ‘Software as a Service’ providers, old players in the market have been forced to raise their usability game and streamline the weekly, monthly and annual administrative tasks you need to complete to keep things rolling along smoothly. Today, instead of paying hundreds of dollars each year for the latest version of your software, you can pay a monthly fee that not only gives you anywhere/anytime access to your data, but also is updated whenever a new accounting rule is made law or an old regulation is updated. The new subscription-based software licensing models means that the old “one license = one computer” system has been smashed. As long as you can get to a web browser and remember your login details, you can raise an invoice, process a payment, reconcile your bank statement and even complete your BAS. Today, you don’t need to install accounting software. 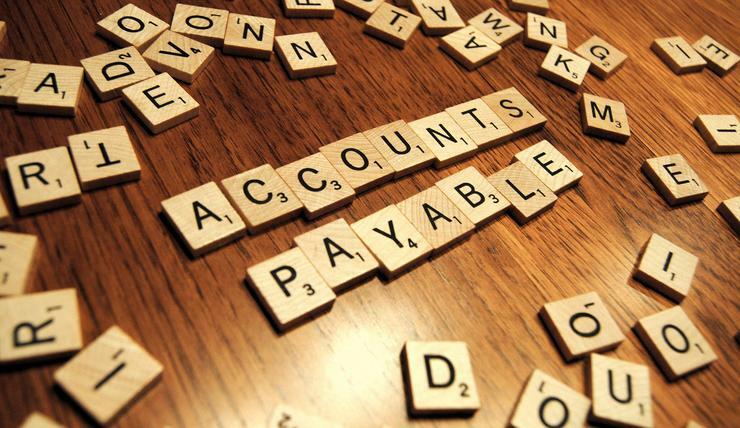 Relatively new players in the accounting software business, who brought cloud services to business and accounting software, compete with established marques like QuickBooks, Reckon, and MYOB. The new players have upped the ante, forcing the old-timers to lift their game and make their applications easier to use, more reliable and up to date. Before jumping in and subscribing to a cloud-based accounting solution, there are a few things you need to consider. Annual fees: With a cloud-based service, you’re moving to a rental or access fee – you’re not actually buying the software. Instead of making a capital software purchase you’ll need to budget for monthly or annual payments. Depending on your needs that could be as little as a few dollars a month up to hundreds. Many Software as a Service (SaaS) providers tell you they’re a cheaper option. But it’s more likely they’re just smearing similar costs over a longer period, much like taking on low or interest-free financing from a furniture store – except that you never actually own the software. Your data: SaaS providers don’t just provide the software – they also hold your data. In some cases, getting hold of your data so you can switch provider or make your own backups can be tricky. And while SaaS providers do their best to protect your data, it’s still up to you to keep reliable backups. Integration: As your business grows and you invest in more SaaS you will probably want different services to work together. For example, you might want the invoicing module in your accounting software to work with your customer relationship system. Do your research to ensure the accounting system you choose can integrate with other applications you might need in future. And don’t forget your address book – having a single address record for all your customers, suppliers and other partners will ensure you don’t have to maintain the same data in multiple systems. Workflow: When you commit to a new software package there will be some necessary adjustment on your part. You’ll need to learn how to use the software to carry out everyday tasks such as entering invoices and receipts as well as produce your monthly or quarterly BAS and reports your accountant will need for preparing your tax return. 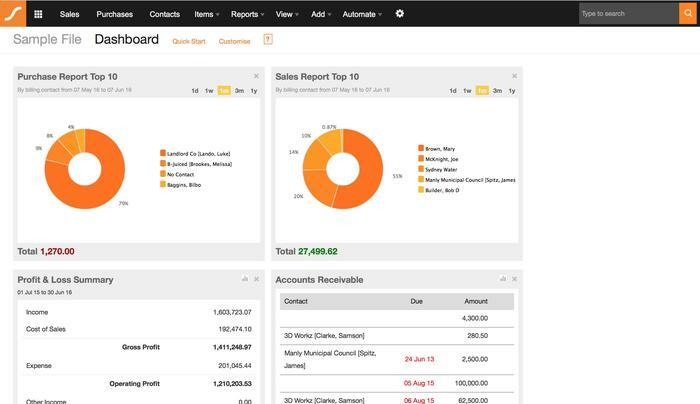 Bank feeds: Cloud-based accounting systems can directly connect to most banks and collect transaction data, saving you the effort of manually typing every transaction. Make sure your bank or financial institution is properly supported. For example, I’ve seen some credit card feeds that are only partially supported resulting in slow feeds or connection errors. Multi-platform and mobile: Although you might do most of your accounting work on a desktop or notebook computer, being able to raise an invoice from a smartphone, or check outstanding accounts from your phone can be handy when visiting a customer. There are many different cloud-based accounting packages to choose from. I’m focusing on the five I think are most likely to make your shortlist of options. 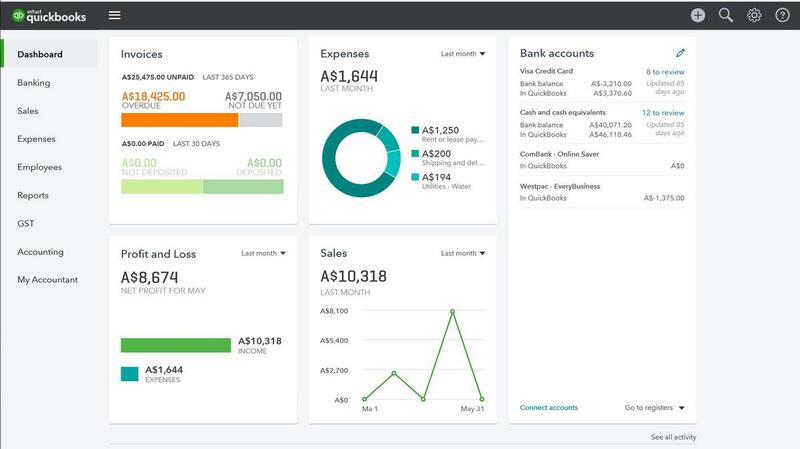 It’s tough to beat Xero as it has a great UI, nice mobile app and great third party integration. But it’s a little pricey. 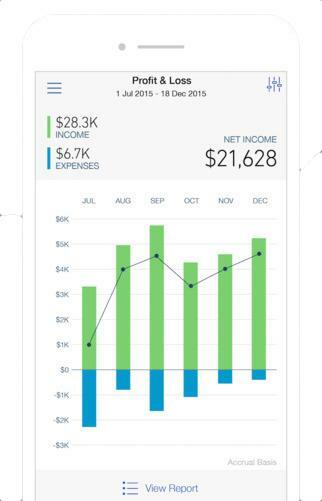 Xero is to online accounting software what Intel is processors. It’s not the only game in town but they have a massive market following and great popularity. The New Zealand-based SaaS was founded over a decade ago and continues to grow. Xero was created for business users, not accountants. However, they have now created a massive ecosystem of accountants who can work directly with business owners to assist them. 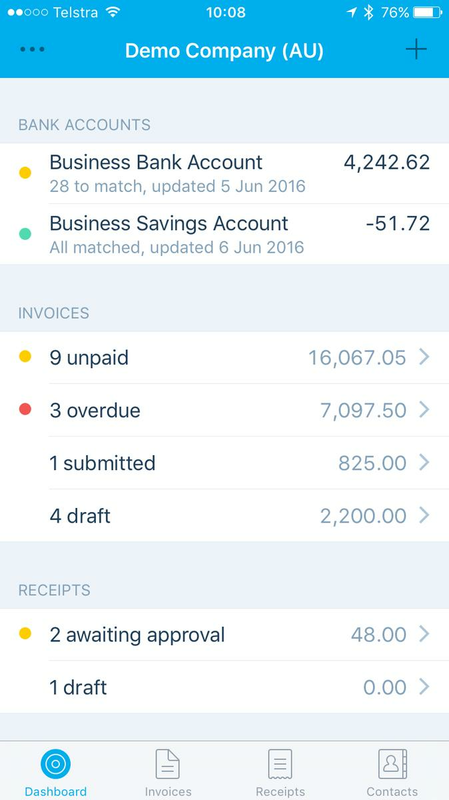 So, while you could use Xero to enter invoices and reconcile statements, your accountant can easily and securely access your information to prepare your BAS and do your annual tax return. 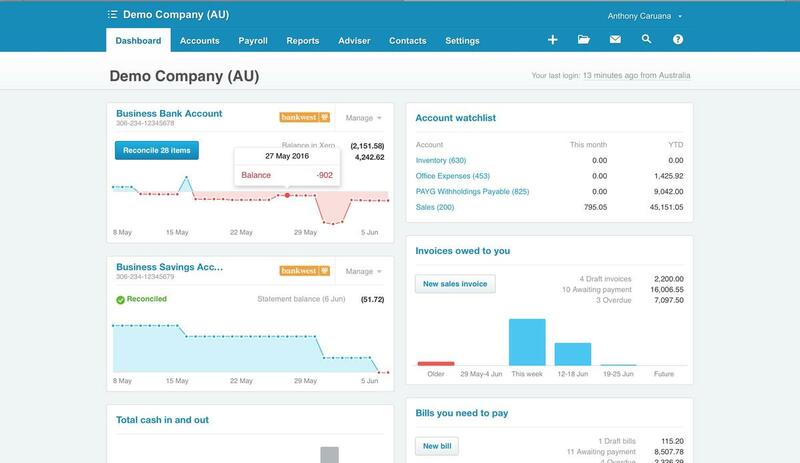 Like all the other applications, Xero launches with a dashboard that displays the information you need to have front and centre with activity buttons where you’d expect them. For example, there’s a dashboard panel with a list of outstanding invoices. On that panel, there’s a button to create a new invoice. The same goes with the “Bills you need to pay” and “Expense claims” panels. You move the panels around to suit your preferences. Connectivity to other SaaS providers is available from the Settings and checking out the Add-ins. There are add-ins for many different vertical industries such as education, hospitality, manufacturing, and not for profits. There’s also integration for various point of sale and payment systems. For example, you could purchase the $40 Square contactless payment device and your Square account will integrate directly with Xero. Payroll is also included, although the entry-level subscription, for $35 per month, limits that to a single employee – which is fine for a sole trader. You’ll need to stump up for a higher subscription level if you have more staff. Automatic superannuation payment management kicks in at $60 per month and you won’t get multi-currency support without paying at least $60 per month. That pricing structure has changed over the years. Feature-wise, the $25 and $50 options are the same. However, the cheaper plan limits the number of transactions you can enter quite significantly – you only get five invoices, five bills, payroll for one employee and just 20 bank transactions. If you're running a full-time business, those limits are likely to push you straight to $50 per month. QuickBooks looks great and, outwardly, has a stronger focus on security than the others. QuickBooks is another veteran of the accounting software business. 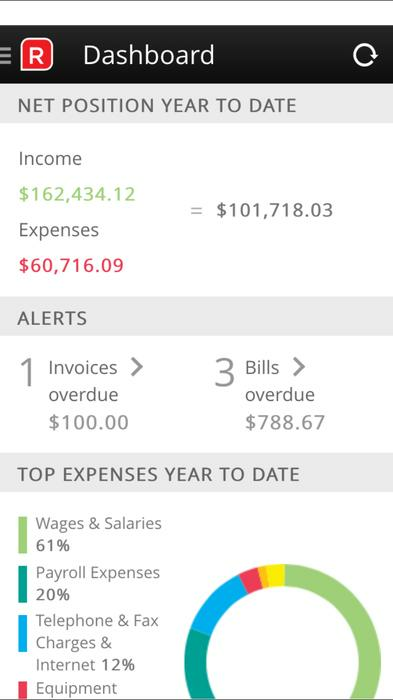 Like the other apps I looked at, there’s an attractive dashboard that puts key data such as income (split into open, overdue and paid in the last 30 days), expenses and profit and loss in front of you as soon as you log in. The account creation process sent a verification code to my phone rather than just relying on email. And there’s an option to help with bringing data across from Excel, Reckon, MYOB or Reckon as well. A guided process helps you add your company logo to QuickBooks as well as customise invoices, connect with an accountant and carry out a few other start-up activities. Once you create a free account – you don’t need to use a credit card – you can access a sample account so you play around with QuickBooks before entering all your own data. However, finding this data requires either searching for “sample file” in the help (or browsing here) after you’ve logged in. The plus sign on the menu bar gives two-click access so you can enter the most common business documents such as invoices, expenses and timesheets. Payroll and inventory management are available but cost extra. One thing I liked was the instant view of my GST status. With a single click of the GST menu on the left side of the dashboard, I received an instant snapshot of what I’ll owe the government on my next BAS. Similarly, there’s an instant snapshot of your bank account balances and how many unreconciled transactions there are in QuickBooks. Creating invoices, receiving payments and other common actions were easy. There’s also an option for integrating PayPal into your invoices so you can receive credit card payments. Although PayPal’s fees can be on the high side, this can be useful for a business that’s starting up and not quite ready to set up a payment gateway with their bank. 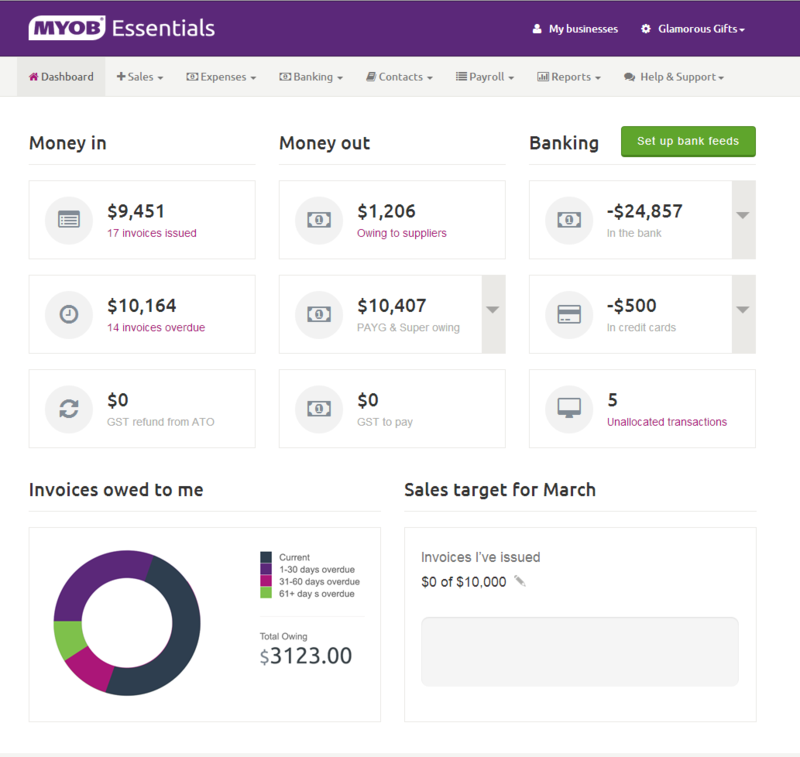 MYOB Essentials is a nice service that will tick most of the boxes for business users and accountants. MYOB was the default option for businesses who needed accounting software. It has been around for decades and enjoys a great global reputation. But, it took the company a while to get on-board with cloud software. After a few attempts, they have got it right with Essentials. 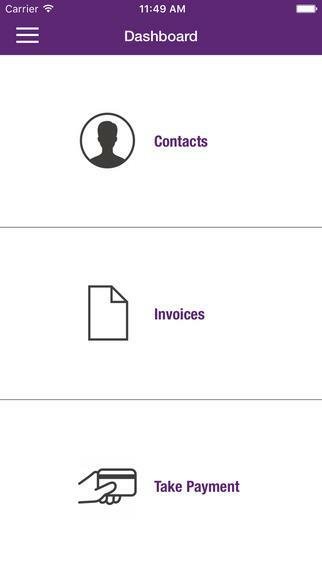 It no longer has MYOB's old “accountants first” mode. It is now an attractive and user-friendly application. 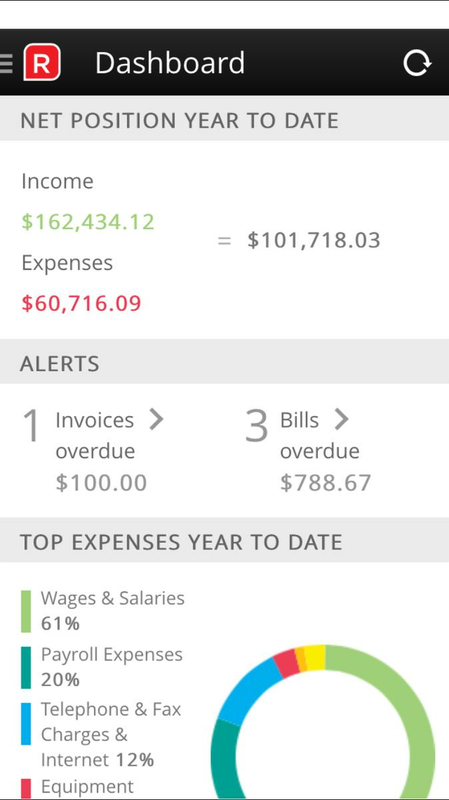 The dashboard provides all the data in plain English terms like “Money in” and “Money out. I'm not an accountant so those sorts of descriptions are very helpful. 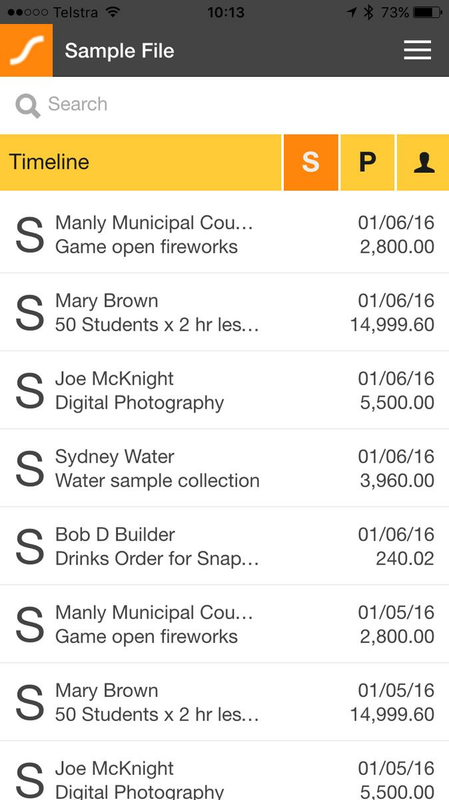 Creating invoices, paying bills and other common actions are rarely more than a click or two away on the top menu. But, like Saasu, it would benefit from having some shortcut buttons on the Dashboard rather than two clicks away in a menu. That would also make the application more touchscreen friendly. Essentials can store scanned documents. For example, when entering a bill, there is a "Link Document" button which lets me upload a scanned document. If I receive a paper bill from a supplier, I can scan and store the paper inside Essentials and link it to a payment so the entire transaction trail is in one place. You can also email documents to your Essentials account. Unfortunately, it doesn’t link to cloud storage services so you can end up with two copies of documents if you don’t keep tight document management processes. There are plenty of reports in the application, ready to go including the essential GST report for completing your BAS as well as Profit and Loss (with a graphical version in beta testing), Balance Sheet and Trial Balance so you can keep your accountant happy. Many accountants still preferring their clients to use MYOB so there’s an easy export function so you can grab all the data your accountant wants and send it off in a single file. And there are options to import data from other systems if you're making the move from another accounting package. Reckon One does a great job of putting everyday tasks front and centre but the mobile app needs work. Reckon One is the cloud accounting software service delivered by established industry veteran Reckon. 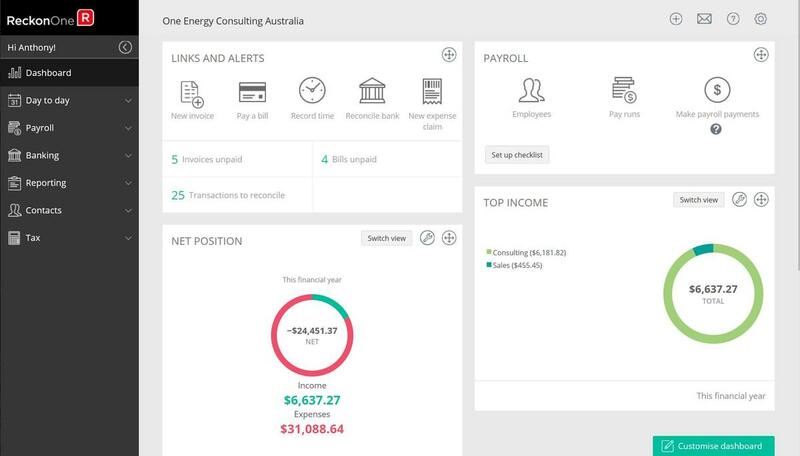 The software looks good, is easy to use and the dashboard you see when you first connect to your company file puts important information front and centre. For example, you won’t have to scramble around to see how many bills you need to pay or how many invoices are overdue. You can, if you have linked your accounts, see bank balances and track them over past months. Pricing is competitive. The core module, is just $5 per month but you’ll want to add invoicing for $3 and BankData for another $3. There is a free trial. Those are minimum fees with higher monthly costs depending on your transaction volumes. But the most you’ll pay, if you opt for the maximum transaction volumes and take up the payroll, project management and time and materials tracking is $37 per month. Using a trial account with dummy data I was able to easily create invoices, pretend to receive payments, track account balances and manage outstanding payments. Even if you’ve never used accounting software, you’ll find Reckon One easy to use. The GST summary report, used for completing your monthly or quarterly BAS loaded quickly. Profit and Loss, Trial Balance and a Balance Sheet were also snappy. Reports are categorised although you can easily create shortcuts to your favourites so you need not go digging through the categories each time you need to load a report. Saasu is competent accounting service that works well thorough browsers on all devices but has dropped the ball with its smartphone app. Like all the other online account apps, Saasu launches with a main dashboard which puts a summary of your Profit and Loss report, cash-flow, and Balance Sheet front and centre along with outstanding invoices, with overdue items highlighted in red, and outstanding bills you need to pay. You can rearrange or remove components depending on your preferences. Both the outstanding invoices and payments can set to display all items or a summarised, per debtor or creditor view. Annoyingly, there's no one-click access to carry out common activities such as adding a new invoice or purchase. I either needed to go to the sales screen or click the add button on the top menu and then choose sale from the list of items. A simple “Add new invoice” button on the dashboard would easily reduce the amount of clicking around – especially with so many of us now using touchscreens. Saasu supports payroll, bank feeds and inventory management although the number of annual transactions you can perform, employees you can have and bank feeds varies depending on your subscription level. At $15 per month, you get 1000 transactions for the year, three bank feeds, no payroll or inventory management. For $180 per month, you get 100,000 transactions, 20 bank feeds, 100 employees and a slew of other features.